Good morning. I am delighted to join all of you at the Symposium on Innovation & Technology (I&T) 2017 Opening Ceremony today. I understand this Symposium is a flagship event of the Hong Kong Electronics Fair (Autumn Edition). As many of you know, I delivered my maiden Policy Address two days ago. 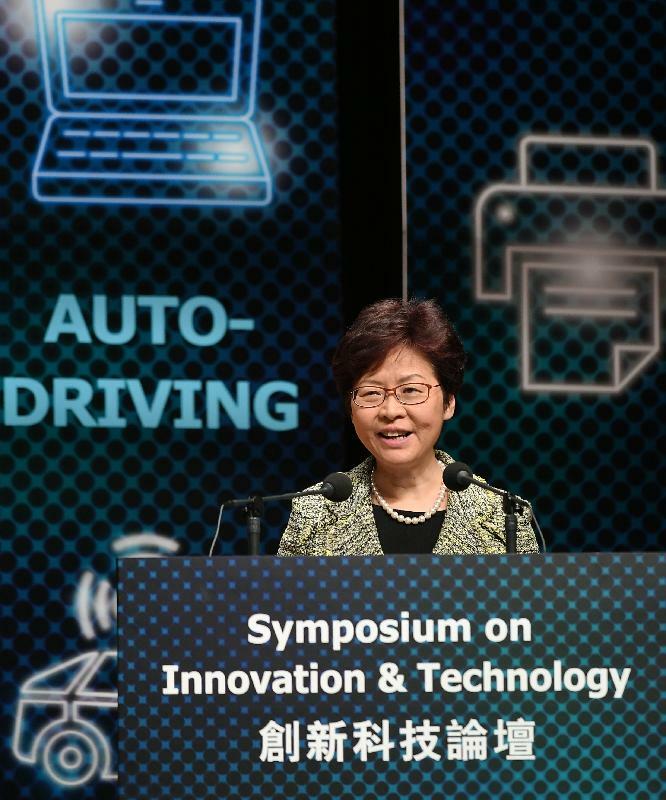 I love to regard my presence at this I&T Symposium as a good post-Policy Address PR for two reasons: one is to reiterate the importance my government attaches to development of I&T in Hong Kong, a subject which has been given prominence in my Policy Address, and the other is to tell our symposium participants and exhibitors that my government is committed to providing more convention and exhibition facilities to meet the ever growing demand for expos, symposiums, conventions, etc to be held in Hong Kong, as I have announced in my Policy Address the proposal to build a new wing of the Hong Kong Convention and Exhibition Centre on an adjacent site now occupied by three government office buildings. These initiatives fit in with my conviction that "the best of Hong Kong is yet to come". In the last month or so, I made two keynote speeches on I&T, first at a Hong Kong X Foundation event during which they launched a white paper on Hong Kong's I&T development and then at the opening of the InnoTech Expo organised by Our Hong Kong Foundation. On both occasions, I confessed that I was on a sharp learning curve as far as I&T development was concerned since taking office on July 1 this year. 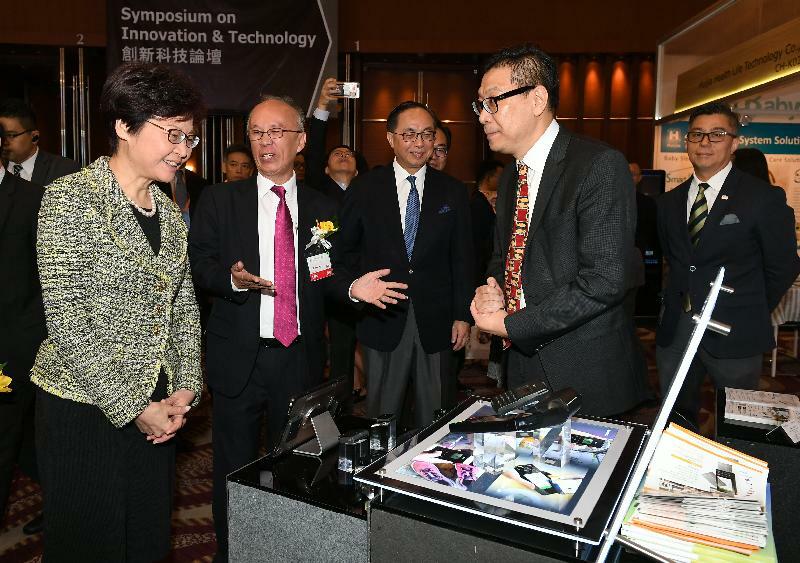 As a result of that learning process during which I had interacted with local, Mainland and overseas experts and visited technology and entrepreneurship projects, I have drawn the conclusion that innovation and technology will help power Hong Kong's future economy, improve people's livelihood and create quality jobs for young people as well as opportunities for young entrepreneurs. First is to increase resources for research and development (R&D). Here, we have set a goal to double the R&D expenditure as a percentage of the Gross Domestic Product from the current 0.73 per cent to 1.5 per cent by the end of the current-term Government's five-year-term of office. Apart from Government injecting more resources into the Research Endowment Fund under the University Grants Committee for allocation to the eight publicly-funded universities, we will take a bold step to provide super tax deduction for expenditure incurred by private enterprises on R&D, to the tune of 300 per cent for the first HK$2 million and 200 per cent for the remainder. Second is to nurture local talent and recruit overseas talents. 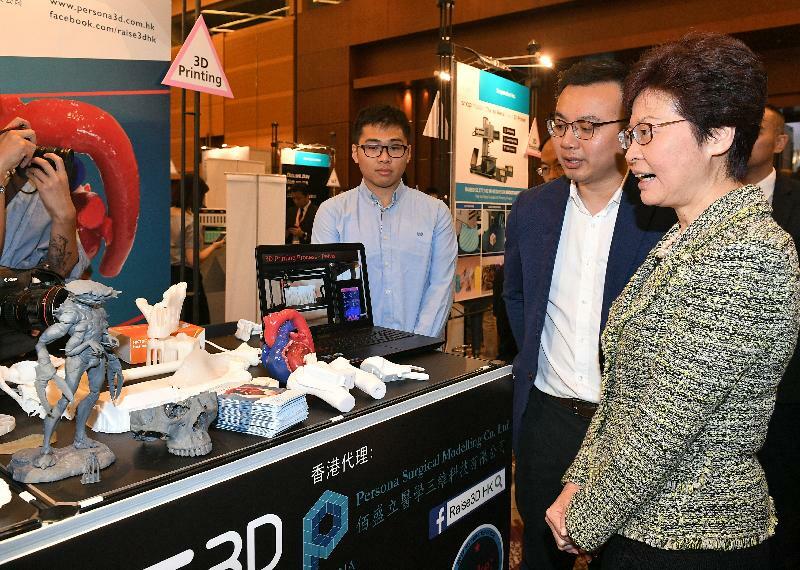 We will launch a HK$500 million Technology Talent Scheme to establish a Postdoctoral Hub to provide funding support for enterprises to recruit postdoctoral talent for scientific research and product development and another HK$3 billion to provide studentships for local students to engage in research postgraduate programmes. We will also invite world-acclaimed universities, R&D institutes as well as technology enterprises to collaborate and carry out forward-looking research projects with social benefits. Third is to provide investment funding to support start-ups. We have seen a number of venture capital funds setting up in Hong Kong in recent years. To further boost the momentum, we have just launched the HK$2 billion Innovation and Technology Venture Fund and are inviting private VC companies to joint hands with the Government to invest in our technology start-ups. I believe that, given time, local enterprises will be more willing and ready to invest in technology development. Fourth is to provide the hardware in terms of technological research infrastructure and related facilities. At present, Science Park, Cyberport, Hong Kong Productivity Council and R&D Centres have been supporting local R&D activities. We have a number of infrastructure projects in the pipeline, including expansion of the Science Park, development of the Data Technology Hub and the Advanced Manufacturing Centre in the Tseung Kwan O Industrial Estate. We are also working in full speed to implement the Hong Kong-Shenzhen Innovation and Technology Park at the Lok Ma Chau Loop, based on an agreement we signed with the Shenzhen Municipal People's Government in January this year. When completed, this will be the largest I&T infrastructure in Hong Kong. A residential building for talent called "InnoCell" is also being built at Science Park and should be completed in 2020. Fifth is to review existing legislation and regulations, so as to remove those outdated provisions that impede the development of innovation and technology. To this end, I realise that there will be a lot of resistance within the Government, so I will task the newly formed Policy Innovation and Co-ordination Unit which works directly to me to spearhead this exercise. Last but not the least is to step up our STEM education both at the school and community level. We will encourage fairs like this electronics fair to consider opening up a day for school visits so that students may be impressed by what technology could offer and inspire them to learn more. On the part of the Government, the Leisure and Cultural Services Department will update the permanent exhibitions of the Hong Kong Science Museum to further promote STEM education using the museum's facilities. I should just add that apart from the eight major areas to promote I&T development, my Policy Address also contains a section of promoting smart city development in Hong Kong and IoT, electronics and technologies all have an important role to play in various smart city initiatives, or what this Symposium's theme refers to - "connected living". In introducing my Policy Address in the Legislative Council, I said that in the coming few years, Hong Kong is entering a period when opportunities and challenges co-exist. This also applies to I&T development. The Guangdong-Hong Kong-Macao Bay Area will bring exceptional opportunity for Hong Kong to join hands with Shenzhen and other Bay Area cities to develop an international I&T centre very much like the Silicon Valley. Hong Kong is blessed with distinct competitive edges including our unique advantages of "one country, two systems", geographical location, business environment, legal system, intellectual property protection, R&D capability, financial services, etc. Also, the setting up of the Karolinska Institutet research centre and an innovation node of the Massachusetts Institute of Technology (MIT) in Hong Kong last year has also created more opportunities for us to work with and attract other renowned research institutes to Hong Kong. The challenge to seizing these opportunities naturally lies in how fast and how effective we are in pressing ahead with the initiatives I have committed to in my Policy Address. I would like to thank the Hong Kong Electronics and Technologies Association and the Trade Development Council in organising this event. May I wish the conference every success and all of you a fruitful experience, and our guests from overseas a very enjoyable stay in Hong Kong.